Gareth Long - Education: The end of BSF..
A staggeringly drastic cut on the world leading BSF scheme has really decimated the world leading investment on English secondary schools. This scheme and the amount of spending has attracted the attention, and admiration, of the world. To lose so much of it is desperately sad. To read the BBC report on this story - please do click here. Whilst I suspect few would query the need to address the government budget situation, many will be upset that education has taken such a hit. There are so many schools that desperately need major work to improve them - the early news indicates that many students will be forced to continue their education in totally substandard and very inadequate learning environments. We all know that high quality learning spaces DO positively affect student performance - surely all young people should be working in learning environments fit for the third millenium - after all we are ten years through it already! Even worse, many staff and students have spent considerable time and thought in helping contribute to designing new environments that will now, never be built. - that is just sad - for so many reasons! You are absolutely right, and it is indeed very sad. 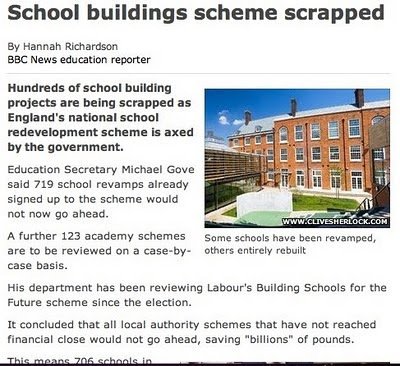 I remain hopeful that this will not be the end of schools capital investment per se. There are two conflicting messages emerging at the moment from Mr Gove, one saying there is no money left because the last government spent it, and another saying that there will be further capital investment once an effective way of delivering it is determined. The hope is that this won't be targetted simply at fixing buildings and will still have a degree of educational improvement and transformation included. My fingers are crossed. Hopefully that means some of the schools may be able to use some of the considerable work they have put in, in the future. In the meantime, I think it is important to begin reflecting on an debating what we did well within BSF, and what could have been done better, in order to improve future building programmes both here and abroad. My thoughts here. more mistakes....and maybe a glimmer of hope..